One of the key roles and responsibilities of a Finance Clerk is to work alongside a wide range of industries and departments to provide financial administrative and clerical services. 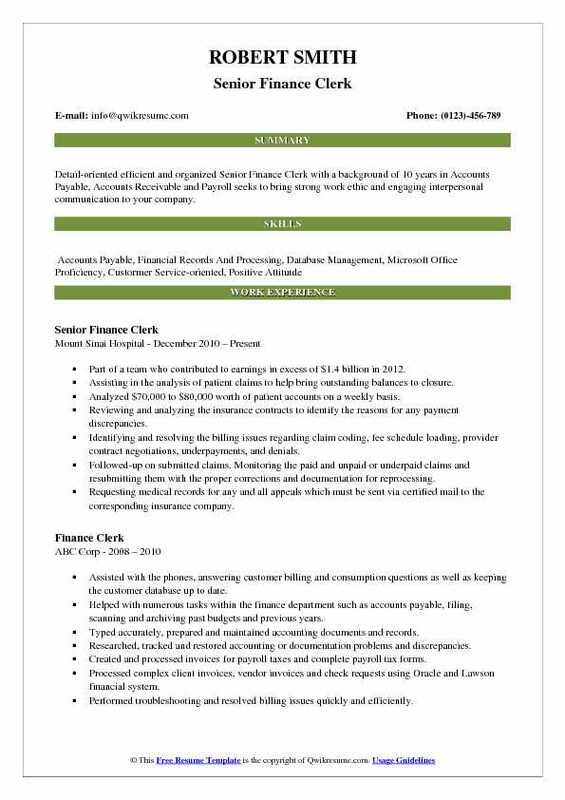 Apart from this, some of the other important job tasks that can be found on a Finance Clerk Resume are customer service, record keeping, assisting in audits, conducting financial transactions, etc. If you are interested in applying for this challenging job role, there are certain qualifications that are expected from – such as strong financial background, practical, hands-on work experience or at least an internship experience, excellent clerical and documentation skills, and up to date knowledge about the recent finance trends. While the minimum education required for this role is a Bachelor’s Degree in Finance or any other relevant domain, a Master’s Degree and relevant work experience are considered to be an asset. Summary : A self-motivated Sr. Finance Clerk offering a strong work ethic with determination to complete tasks in a timely manner. 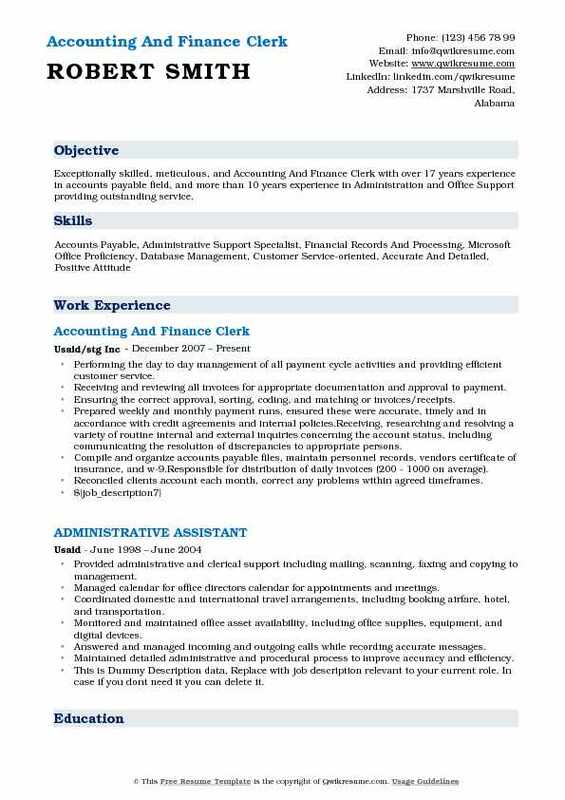 Accurate and detail-oriented with extensive clerical knowledge of 9 years in the Finance domain. Processed all travel claims and adjusts related vouchers, under the supervision of the Disbursement Officer. The focal point of electronic archiving in the finance section and scanning all financial vouchers and documentation, through easy: electronic archiving system. Processed travel claims of outside mission area in accordance with un financial rules and regulations, for international, UNVS and national staff as per travel authorization, calculating their entitlement in terms of DS, terminals and miscellaneous expenses. Recorded entries into sun business and sun account for corresponding payments. Processed in sun account travel advances for international, UNVS and national staff who travel on official business outside mission area as per travel authorization. Processed reimbursement of entry medical expenses for the international and local staff. Processed within mission area travel claims for international and UNVS based on authorized mops, calculating entitlement amount to be settled and recording in sun business for the corresponding payments. Processed advance payment of terminal expenses for military observers and staff officers on repatriation travel. 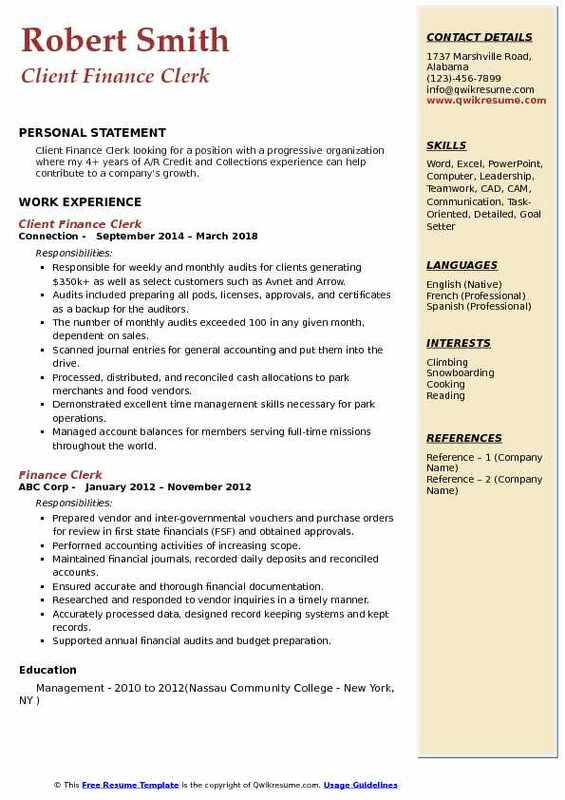 Objective : Junior Finance Clerk with 3 years of expeirnece wants to obtain employment with an eminent organization that will become more prosperous and will offer growth and opportunity based upon performance through my knowledge in the fields of Business Management, Accounting, and Administrative Support. 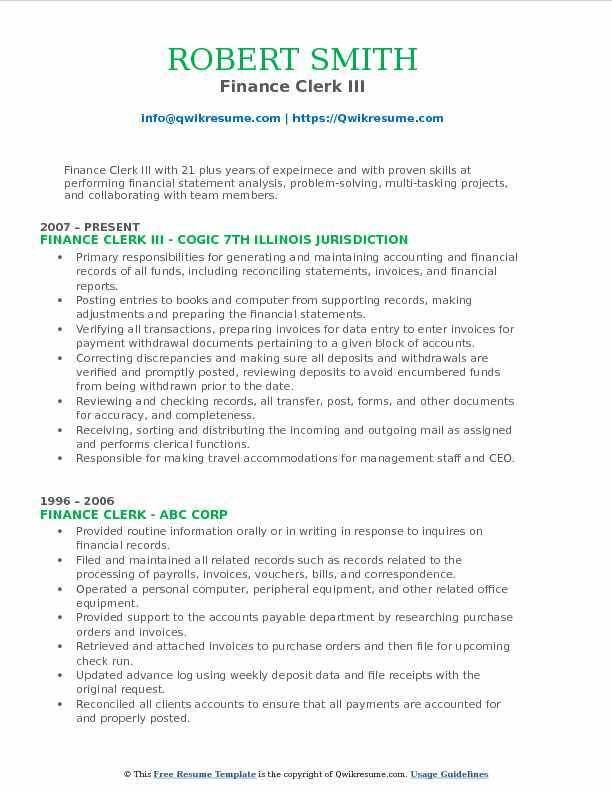 Skills : Accounts Receivable, Reconciliations, QuickBooks, IOLTA Accounts, Accounts Payable, GJ Entries, MS Excel, Government Grants, Payroll Processing, Financial Statements, GAAP, NFP Audit Preparation. Verified, analyzed, and allocated bills on a strict accrual basis. Worked with the CEO to determine payment of bills on a cash flow basis, process payments. Processed invoices in relation with federal, state, and county grants awarded. Analyzed and verified timesheets and process semi-monthly payroll. Processed monthly payments to 200+ care providers by check or ACH payment. Allocated income and expense via class to multiple internal programs and grants. Produced monthly financial reports to the Board of Directors for review, including charts and graphs to give an accurate visual representation of the information provided. Produced correct and full support information for grant and internal audits. Ensured all checkbooks are balanced and reconciled correctly. Ensure all bills are paid in a timely manner. Processed incoming and outgoing mail. Summary : Detail-oriented efficient and organized Senior Finance Clerk with a background of 10 years in Accounts Payable, Accounts Receivable and Payroll seeks to bring strong work ethic and engaging interpersonal communication to your company. Part of a team who contributed to earnings in excess of $1.4 billion in 2012. Assisting in the analysis of patient claims to help bring outstanding balances to closure. Analyzed $70,000 to $80,000 worth of patient accounts on a weekly basis. Reviewing and analyzing the insurance contracts to identify the reasons for any payment discrepancies. Identifying and resolving the billing issues regarding claim coding, fee schedule loading, provider contract negotiations, underpayments, and denials. Followed-up on submitted claims. Monitoring the paid and unpaid or underpaid claims and resubmitting them with the proper corrections and documentation for reprocessing. Requesting medical records for any and all appeals which must be sent via certified mail to the corresponding insurance company. Transferring secondary balances to the appropriate financial class for processing and payment. Sorting and distributing daily lock-box contents for the entire department including, but not limited to, checks, self-pays, and numerous explanations of benefits. Transferred 2,500 patient statements into the on-base system on a daily basis. Researching and identifying the patient care approvals, denials, refunds and workers compensation cases. Performed analytical procedures and researched financial transaction within customer and dealer accounts to determine any discrepancies. Identified and communicated auditing and financial accounting matters to managers and dealers. 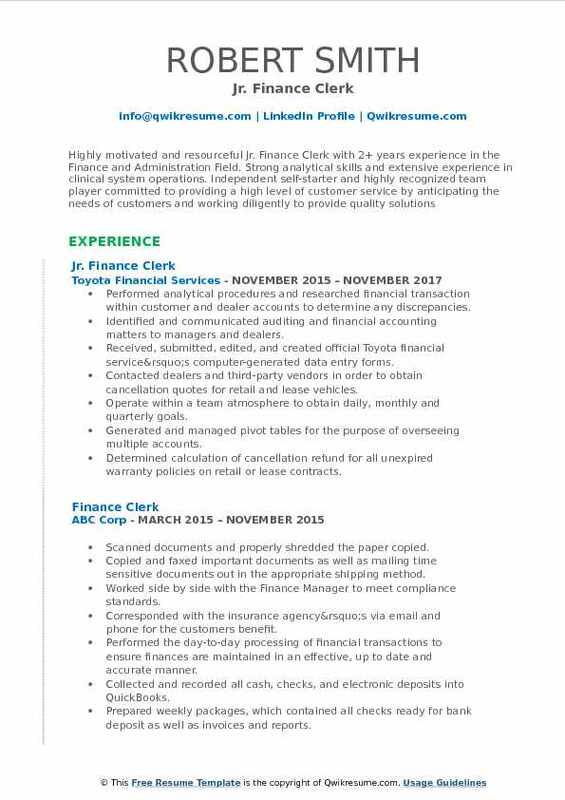 Received, submitted, edited, and created official Toyota financial service’s computer-generated data entry forms. Contacted dealers and third-party vendors in order to obtain cancellation quotes for retail and lease vehicles. Operate within a team atmosphere to obtain daily, monthly and quarterly goals. Generated and managed pivot tables for the purpose of overseeing multiple accounts. Determined calculation of cancellation refund for all unexpired warranty policies on retail or lease contracts. Creating and updating monthly financial statements in a format requested by the finance committee. 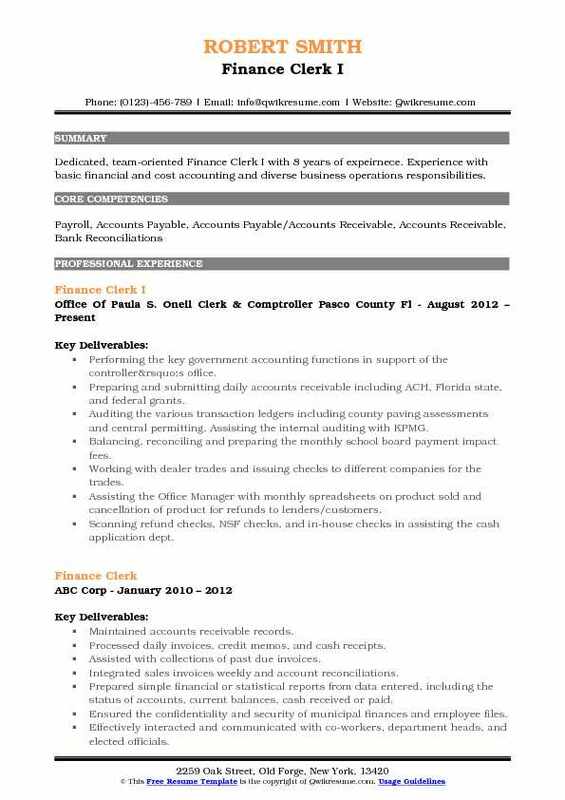 Summary : Finance Clerk with 10 years of experience in bookkeeping and expertise in a variety of accounting functions including payroll, general ledger, accounts payable and accounts receivable. Values learning latest programs and processes. Diverse industry experience in banking, construction, and customer service. Organized Finance Clerk recognized for strong rapport building with all levels of an organization and the public. Efficiently balancing the general ledger accounts by using specified spreadsheets in MS Excel. Assisting in the preparation of the end of month financial reports as needed. Demonstrating proficient IRA knowledge necessary to serve as IRA representative. Preparing the regulatory reports such as the quarterly call report with software including Silverlake. Balancing the ATM with general ledger and effectively communicate with electronic banking. Completed the training courses in the area of information security in the workplace annually. Monitoring website for new applications and customer service requests, processing such applications. Monitoring the website to make sure all links are functioning properly and log all changes, applications. Performing night processing duties which consist of initiating the end of the day processing for the bank. Summary : Exceptionally skilled, meticulous, and Accounting And Finance Clerk with over 17 years experience in accounts payable field, and more than 10 years experience in Administration and Office Support providing outstanding service. Performing the day to day management of all payment cycle activities and providing efficient customer service. Receiving and reviewing all invoices for appropriate documentation and approval to payment. Ensuring the correct approval, sorting, coding, and matching or invoices/receipts. Prepared weekly and monthly payment runs, ensured these were accurate, timely and in accordance with credit agreements and internal policies. 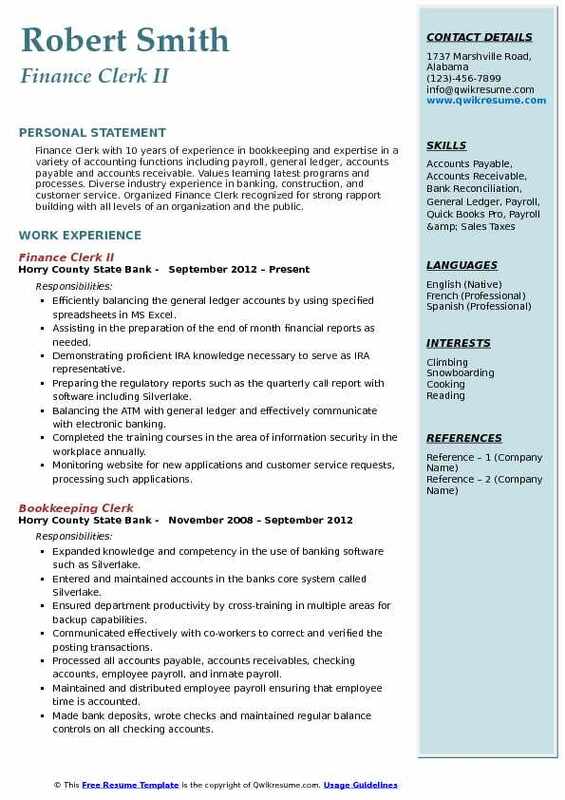 Receiving, researching and resolving a variety of routine internal and external inquiries concerning the account status, including communicating the resolution of discrepancies to appropriate persons. Compile and organize accounts payable files, maintain personnel records, vendors certificate of insurance, and w-9. Responsible for distribution of daily invoices (200 - 1000 on average). Reconciled clients account each month, correct any problems within agreed timeframes. 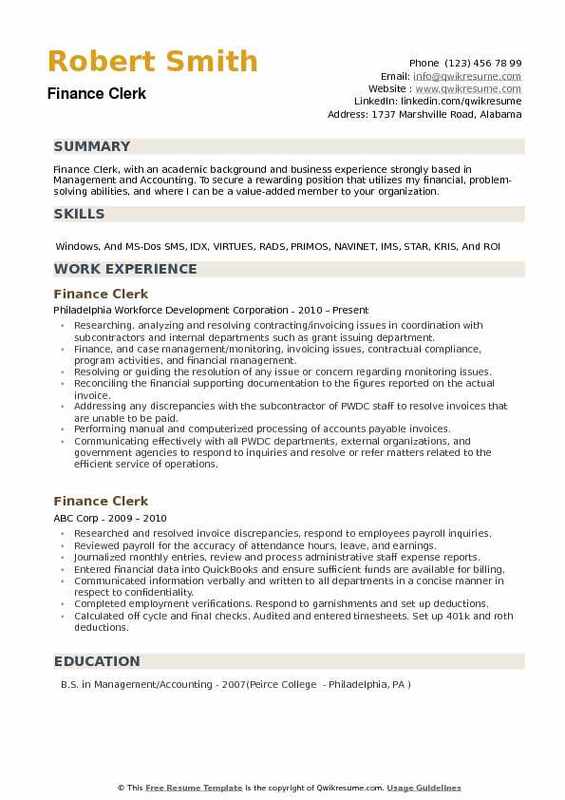 Summary : Finance Clerk III with 21 plus years of expeirnece and with proven skills at performing financial statement analysis, problem-solving, multi-tasking projects, and collaborating with team members. Primary responsibilities for generating and maintaining accounting and financial records of all funds, including reconciling statements, invoices, and financial reports. Posting entries to books and computer from supporting records, making adjustments and preparing the financial statements. Verifying all transactions, preparing invoices for data entry to enter invoices for payment withdrawal documents pertaining to a given block of accounts. Correcting discrepancies and making sure all deposits and withdrawals are verified and promptly posted, reviewing deposits to avoid encumbered funds from being withdrawn prior to the date. Reviewing and checking records, all transfer, post, forms, and other documents for accuracy, and completeness. Receiving, sorting and distributing the incoming and outgoing mail as assigned and performs clerical functions. Responsible for making travel accommodations for management staff and CEO. Performing the timekeeping duties as a backup timekeeper for the department and responsible for filling out requisitions form for special orders and office supplies. 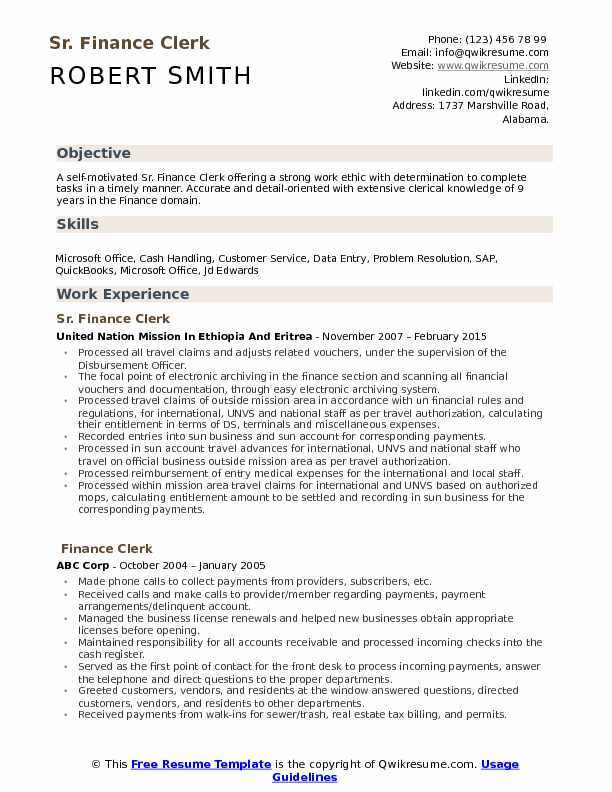 Summary : Dedicated, team-oriented Finance Clerk I with 8 years of expeirnece. Experience with basic financial and cost accounting and diverse business operations responsibilities. Performing the key government accounting functions in support of the controller’s office. Preparing and submitting daily accounts receivable including ACH, Florida state, and federal grants. Auditing the various transaction ledgers including county paving assessments and central permitting. Assisting the internal auditing with KPMG. Balancing, reconciling and preparing the monthly school board payment impact fees. Working with dealer trades and issuing checks to different companies for the trades. Assisting the Office Manager with monthly spreadsheets on product sold and cancellation of product for refunds to lenders/customers. Scanning refund checks, NSF checks, and in-house checks in assisting the cash application dept. Met special invoice requirements for a $5m account to expedite customers payment. 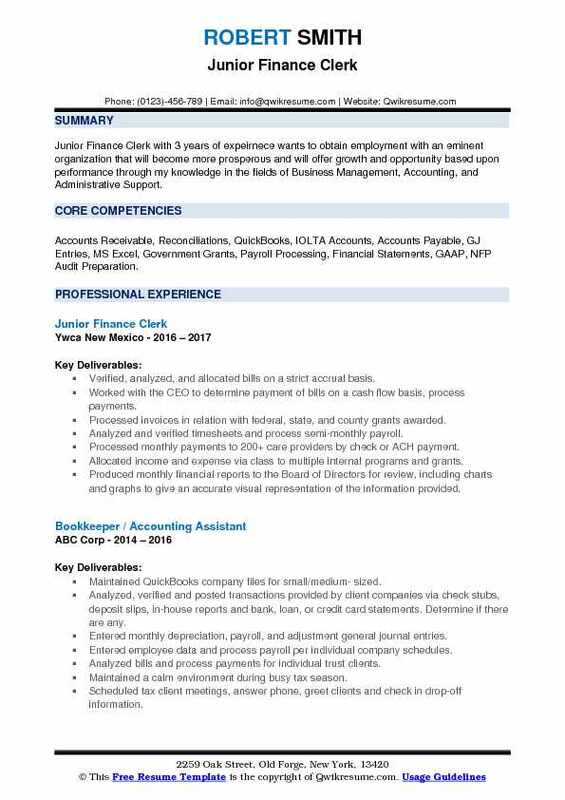 Objective : Client Finance Clerk looking for a position with a progressive organization where my 4+ years of A/R Credit and Collections experience can help contribute to a company's growth. Responsible for weekly and monthly audits for clients generating $350k+ as well as select customers such as Avnet and Arrow. Audits included preparing all pods, licenses, approvals, and certificates as a backup for the auditors. The number of monthly audits exceeded 100 in any given month, dependent on sales. Scanned journal entries for general accounting and put them into the drive. Processed, distributed, and reconciled cash allocations to park merchants and food vendors. Demonstrated excellent time management skills necessary for park operations. Managed account balances for members serving full-time missions throughout the world. Maintain edand organized financial records in preparation for semi-annual financial audits. Managed and facilitated budget needs and expenses across different auxiliary organizations. Summary : Finance Clerk, with an academic background and business experience strongly based in Management and Accounting. To secure a rewarding position that utilizes my financial, problem-solving abilities, and where I can be a value-added member to your organization. Researching, analyzing and resolving contracting/invoicing issues in coordination with subcontractors and internal departments such as grant issuing department. Finance, and case management/monitoring, invoicing issues, contractual compliance, program activities, and financial management. Resolving or guiding the resolution of any issue or concern regarding monitoring issues. Reconciling the financial supporting documentation to the figures reported on the actual invoice. Addressing any discrepancies with the subcontractor of PWDC staff to resolve invoices that are unable to be paid. Performing manual and computerized processing of accounts payable invoices. Communicating effectively with all PWDC departments, external organizations, and government agencies to respond to inquiries and resolve or refer matters related to the efficient service of operations.